taking photographs indoors with an iPhone. At night. 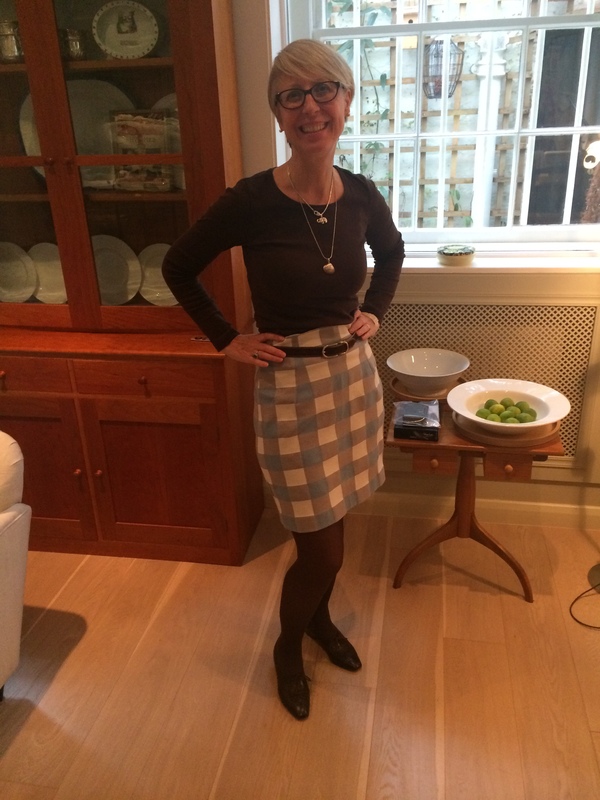 It shouldn’t really work on me – a light skirt with a dark top. But I think it is OK. I made the skirt longer than I usually wear, hemming it just below the knee. I have accessorised it with a dark belt to emphasis the slimmest part of the skirt. I used unique fabric – home-printed beige viscose-linen by Fleur de Carotte. You can read the story of how she made it, and see the skirt she made for herself in the same fabric. I like the idea of the two of us walking around in the same piece of cloth (that is her skirt, top left) . I love the cheery, subtle design and the scale is perfect for me. The fabric is lovely – easy to sew, with a nice drape. It was not the ideal, first choice fabric for a fairly structured skirt. But it is heavy enough to just about hold its shape although it does crease badly. The pattern is home-made too. I used my self drafted curvy-pencil skirt pattern again. This time I adapted it to include a grown-on waist band. This means that the waist band is omitted and the skirt front is elongated and shaped to finish slightly above the natural waist. It is quite an easy adaptation. Just draw in a new waistline say two inches above the waist line of your trouser or skirt block and extend the darts with parallel legs to the new waist line. Create matching facings. 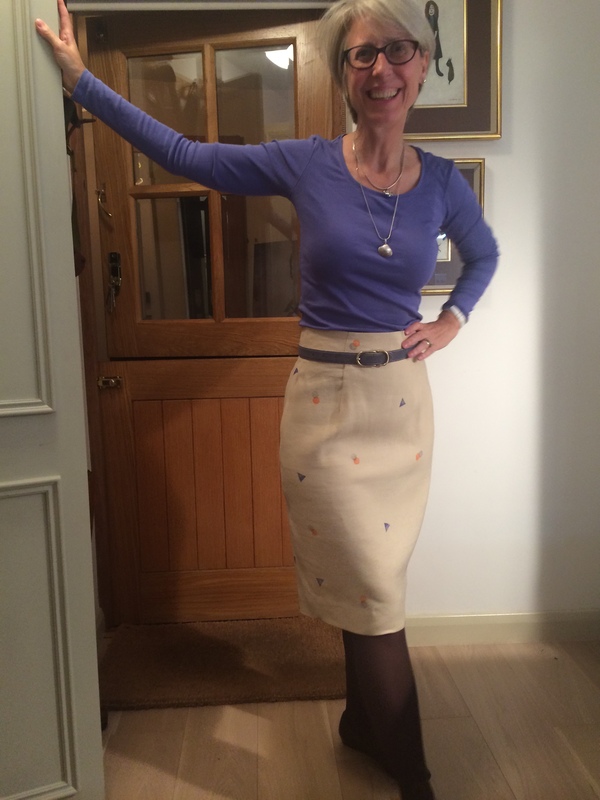 I like this look on a pencil skirt as it helps create a long slim line, which is why I made this skirt a little longer. If you are blessed with a long, slim torso this look will celebrate it. Also anything with an apparently high waist will elongate the legs. Hollywood waist means a fitted waistline with a facings rather than a waistband. It was very popular on the A-line skirts of the late 1950s and early 1960s, when the hourglass shape was in vogue. It can be used on a high waist, a natural waist, or a low waist/hip hugging waist. Most high-waisted pants are faced rather than banded, so they’re also Hollywood waists. If you are pear-shaped, the grown-on waist works a treat. 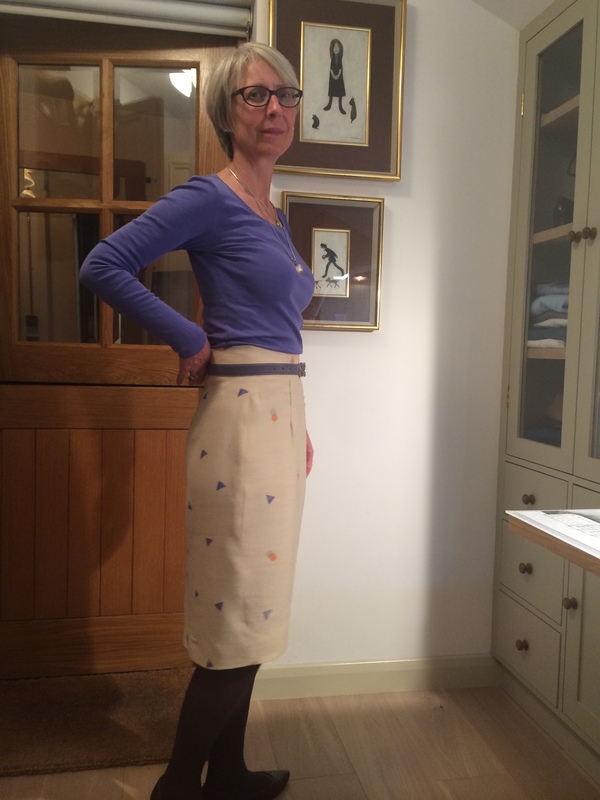 I made another skirt up, this time a short version. I also took a risk on using a check fabric, a nice piece of wool from the remnants box at Misan fabrics (£3) which shouldn’t work for this skirt. But I think it does. However I would love to hear other views! Do you wear light coloured skirts or trousers even if you have bigger hips? Or vice versa? If so, what makes it work? Probably when using a check fabric (and again it is lighter shade than the dark brown T-shirt) it is better to use a pattern with a straight side seam. I chose this fabric because I liked the colours and the slightly heavy but flexible fabric. I found that the skirt goes really well with my Chanel-style jacket, creating a nice little suit. I have been trying to think what might go well with that jacket for ages, and now I seem to have fixed that dilemma almost by accident. It is funny how the visual/colour part of the brain works. The check skirt is taken in daylight. You need light to take a photograph. Elementary error with the top two pictures. They both suit you perfectly, well done. The grown-on waistband is a very timely recommendation as I’m drafting similar and was really worried about how that waistband would have sat. I like the dark top, pale skirt combo and I think it’s only an unwise idea with trousers when there’s a part that looks lumpy! I think this style of waist finish suits you well – and both hem lengths look good, too. Would you say that you are slightly long-waisted compared to the average pattern’s proportions? I can’t imagine that the higher waistline would suit a short-waisted person very well. Thank you for your interesting observation Dustin. I believe that many women with wider hips often have relatively flat stomachs, whereas women who carry their weight around the middle often have slimmer hips. My grown on waist is only 2 inches deep, compared to a waist band of say one to one and a half inches deep. Many wider belts would be two inches deep. I sincerely love both of these. You have a great eye! The proportions look great for both of these. I don’t see why there have to be rules. Perhaps if there is an extreme difference between hips and torso it could be reasonable to always put dark colours on the bottom, etc., although even then I don’t think it has to be a hard and fast rule. It’s quite fashionable right now to wear white jeans in winter. I really like the grown-on waistband and may copy you on this for the skirt I want to make with my green plaid fabric, although I don’t yet have a go-to pencil skirt pattern. Dustin makes a great point about a short- vs. a long-waist. I am short-waisted so I tend to keep my high-waists slightly below the natural waist. Lovely fabrics and good fit. I don’t know why there aren’t more skirt patterns sans waistbands, I prefer using petersham, much better for eliminating bulk. I have some considerations about your skirts. Visually, the second photo looks better because you have a contemporary and cohesive look and the skirt length is spot on. To my eyes the length of the light skirt is a dated look and the dark tights don’t ‘go’. I thought you looked great in an earlier post in similar colours with a shorter light skirt, blue top and blue loafers, I think that grouping was inspired. This is an entirely a subjective viewpoint, and is more of a styling issue than colour combo. I aspire to perfect proportions, our brains respond positively to the golden ratio, and getting that right is half the battle, but it’s easier said than done. Thank you very much for the detailed feedback. I really appreciate it. I have used petersham but have got to the stage in life that I want a fairly soft fit around the middle, so the grown-on waist band is attractive. It smooths out the waist, fits snuggly and elongates it while not cutting across when you bend or move. I completely agree with you about the length. I just don’t like a longer skirt on me as I feel it shortens my lower leg. I default to on or just above the knee. 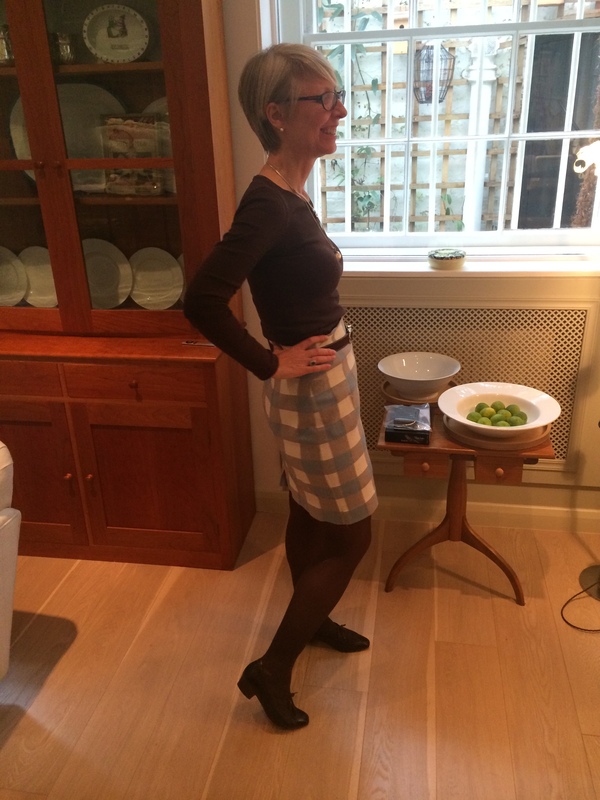 However as my thighs are relatively long a short skirt does look fine on me, even quite a short one. Even shorts! But I feel I need to wear darker tights to pull off a short skirt or shorts.